Take the board game of Life, and mix with a heavy sprinkling of Risk (or the stellar iPhone tribute Strategery [ ]), and you’ll have the beginnings of KarmaStar. The game, currently on sale for $1 from Majesco Entertainment seems a bit childish when you first dive in, but quickly defines itself as a unique board/card/dice game with a decent dose of strategy mixed in. I can’t stop playing it. Space Fight: When challenging an opponent to a battle (whether your rival is computer-controlled or a living, breathing player connecting via Wi-Fi), your goal is to out-roll them and score two points for a victory. My first impression of KarmaStar was an overload of cuteness. The game’s got a great visual style, but I do wonder whether the overly kid-friendly look does KarmaStar a disservice. The game’s cuteness is pervasive throughout… but so is its fun. Each game lasts eight rounds, as the players move from infancy to old age in the game’s timeline. You play against two other players, either computer-controlled or human via Wi-Fi. All players begin with 10 stat points divided randomly over five traits: health, intelligence, love, people skills, and money. To start each turn, you choose from one of three moves the game offers up to you, also at random. You can either go for guaranteed stat-boosters that better your trait levels but add just one point to your score, or you can risk battling another player, pitting your traits against theirs—scoring two points if you emerge victorious. KarmaStar smartly incorporates a variety of in-game bonuses and rewards. Bonuses often offer a challenging choice—discarding two trait stats in exchange for an extra turn hurts, but might be worth it. And rewards, which of course add to your score, are plentiful—for getting 5s in your different traits, for defeating both of your opponents in battle, and so on. The game sorely needs a way to make your computerized opponents play faster. Their turns go by in real-time, even when one computer character is battling another. I’d like the ability have them speed through turns so that I can go again. Three times—that’s how many times I had to play (and lose) KarmaStar before I really figured out that this was a game with some real strategic depth. The combination of careful planning, risk taking, and chance make the game a fun, addictive challenge. 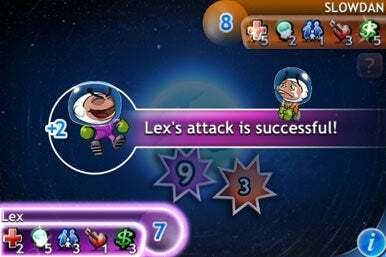 And since the game sports multiple levels of difficulty for computer opponents, in addition to the ability to play your friends via Wi-Fi, there’s plenty of replay value. KarmaStar is compatible with any iPhone or iPod touch running the iPhone 2.1 software update.